Since I last made a post, I’ve been in the process of preparing to move from Michigan and head to the East Coast where my family lives as I keep looking for the next library where I’ll work. My days are mainly full of those tricky decisions that come with moving including what books do I keep and which ones come with me. 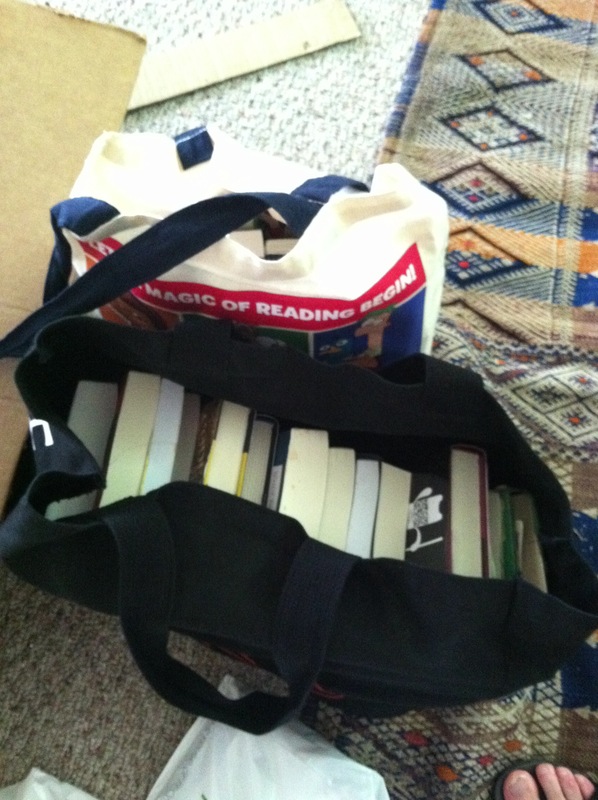 I’m slowly working my way through my two tote bags full from ALA. Every book that I finish, I review on Goodreads, which can be found . As I’ve been preparing for my move, I keep thinking over my experiences at ALA and how wonderful it was to be surrounded by librarians, publishers and people who care about books. I was impressed by how much the authors gave of their time to connect with readers and librarians through events like the YA Author Coffee Clatch, the various awards dinners and all the signings. Since I spend a good deal of time on Twitter and book blogs, I’ve seen there how some authors reach out to readers, but it was wonderful to see that same care happen in person. I know that those kinds of interactions ask for the authors’ time, so it means a lot that they’re willing to make themselves available for us. I don’t know when I’ll next get to an ALA conference, but I hope its not too far in the future. When I next do, I’ll be better prepared for how multiple conferences go on at the same place and that when you attend, its important to decide what are your priorities. Most of my time at ALA 2013 was spent exploring and trying to get a sense of everything that was happening. That meant that I missed certain aspects, I didn’t attend any of the various governance meetings or as many workshops or programs as I might have. Yet I spent a good deal of time on the exhibit floor and had wonderful interactions with a variety of people. I have no regrets about my experience and look forward to my next one. Before I attended ALA, I was aware of how publishers gave out ARCs and sold books for cheaper at conferences. I’ve read many posts about taking and using books, who should get them and what does it mean to have an ARC. My first experience with ARCs was in a graduate school course where the professor gave ARCs to our class as a way to broaden our reading and helping her to clear out her shelves. Through that class, I discovered one of my favorite authors, Cinda Williams Chima as the ARC for The Demon King wasn’t as fancy as the others but the blurb made me curious. I had read her Heir series but The Seven Realms’ books clicked for me even more than the Heir books. It felt like a wonderful symmetry when I was able to pick up an ARC for the newest Heir book at the Disney-Hyperion booth. At ALA, I ended up spending a great deal of my time wandering the exhibit hall but in particular the aisles where the publishers were gathered at the back. It felt like an almost separate space and I was fascinated by all the ways that publishers and authors were reaching out to librarians and to see the various forms that relationship took. Due to another commitment, I wasn’t present when the exhibit hall opened and so didn’t see as one of the librarians at Real World, Real Tools called, “the running of the librarians.” Instead my first glimpse into the exhibit hall was at about 11 on Saturday morning, when due to a happy accident, I took the escalator that came up on the exhibit hall. This put me in the perfect place to stop in at the ALA Joblist center where I had some wonderful meetings. Then I was able to walk straight into the publishers’ aisles. I think I ended up acquiring the majority of my books in that first morning as I was swept up in this feelings of scan my badge, get a book, this is amazing. It wasn’t until I took the time to sit down, have lunch and look over my books that I began to be more thoughtful. For the rest of the conference, when I went through the aisles, I tried to have more conversations with publishers, authors that didn’t have long lines and think about what I was taking. The types of books I chose to take were YA novels, books I might not normally read and nonfiction. My aim as I stated in the other post is to do reviews for every book that I bought or received at ALA. Since it feels like that’s part of the trade off for the publishers being willing to bring their books for such discounted prices to librarians. We generate word of mouth for them in exchange for them giving us better opportunities. I had been aware that author signings were a major part of the conference but just like the amount of books and set up for their giveaways, seeing them happening was another matter. Since I spent most of my time wandering and not going to anything in particular, I would keep coming across lines as they curved around or see the author at the front. It was a little disconcerting but I was impressed by how well they were managed. Though I found it a shame how some authors didn’t have a lot of lines and others were long. It was a sign of the differences between the large publishers and the smaller ones, but it was refreshing how many smaller publishers were there. One of the best surprises for me of ALA was the Artist’s Alley and Graphic Novel Stage, which felt like they had been dropped in from a fandom convention. I’ve been to a number of fan conventions from small ones like Conclave in Michigan to large ones such as Armageddon in Wellington, New Zealand and the Artist’s Alley appears in all of them. It was small at ALA, only taking up about one aisle and it appeared to be where mainly the graphic novel and comic book artists spent their time. I found it refreshing for the lack of lines and how open the artists were to connect as I was told this was only the second year that the Artist’s Alley had been set up. The Graphic Novel Stage was the perfect complement as it was a small and intimate space where artists and authors talked and the range of topics was fascinating. On Monday, it was sad to see the exhibit hall being packed up but I enjoyed having another chance to get a closer look at what publishers had. There were books that I was curious about but didn’t pick up as I wanted to make sure I did justice to the ones I had picked up. Its a difficult balance knowing how many books and which books to bring home. I appreciate how publishers have to balance selling books and giving away books at a conference like ALA. Overall, the exhibit hall was my favorite part of ALA with the many worlds mixing and seeing the conversations and moments that happen when librarians, fans, authors and publishers exist in one place.